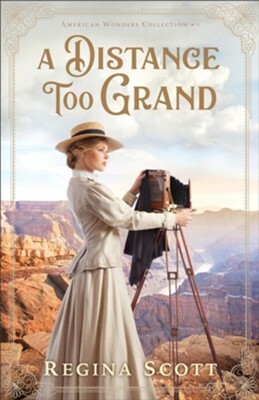 Meg Pero has been assisting her photographer father since she was big enough to carry his equipment, so when he dies she is determined to take over his profession--starting with fulfilling the contract he signed to serve on an Army survey of the North Rim of the Grand Canyon in 1871. What she doesn't realize is that the leader of the expedition is none other than the man she once refused to marry. Captain Ben Coleridge would like nothing more than to leave without the woman who broke his heart, but he refuses to wait even one more day to get started. This survey is a screen for another, more personal mission, one he cannot share with any member of his team. As dangers arise from all sides, including within the survey party, Meg and Ben must work together to stay alive, fulfill their duties, and, just maybe, rekindle a love that neither had completely left behind. Regina Scott is the author of more than 40 works of warm, witty historical romance. Her writing has won praise from Booklist and Library Journal, and she was twice awarded the prestigious RT Books Reviews best book of the year in her category. A devotee of history, she has learned to fence, driven four-in-hand, and sailed on a tall ship, all in the name of research. She and her husband of 30 years live south of Tacoma, Washington, on the way to Mt. Rainier. I'm the author/artist and I want to review A Distance Too Grand (American Wonders Collection Book #1) - eBook.